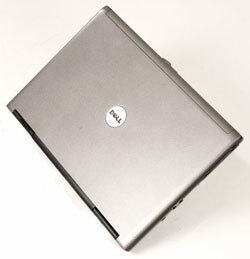 Dell Latitude D620 is a Yonah-based notebook computer powered with Intel Centrino Duo Mobile Technology which incorporates an dual-core Intel Core Duo processor,either Intel 945 GM or 945 PM chipset and Intel PRO/Wireless 3945 Wi-Fi mini-card. Dell Latitude D620 features premium Wi-Fi productivity with dual-band Wi-Fi which supports 802.11 a, b or g network and a special Dell Wi-Fi Catcher that constantly scans for wireless hotspots and notifies you whenever it detects one. Also included is integrated mobile broadband capability EV-DO. TrustedReviews reviewed Dell Latitude D620 laptop and recommended the laptop with rating of 9 out of possible 10, with conclusion that if the D620 is anything to go by, Dell’s new Latitude range will be a force to be reckoned with, offering great specification and impressive performance at a very affordable price. And once Dell starts to offer the integrated 3G module as an option, these machines will become even more desirable. Ultimately, Dell is getting ever closer to the ThinkPad in every respect, and anyone who’s about to sanction a business notebook rollout should give serious thought to the D620. CNet gave the D620 a good rating of 6.9 out of 10 and concluded that with good performance and a complete range of connectivity options, the new thin-and-light Latitude D620 will keep you in business when you’re away from the desk, but its battery life is merely average. The good that CNet found about the notebook are affordable price; fast mobile performance; reinforced case; plenty of component options, such as Intel Core Duo processors; excellent security and wireless connectivity features, such as a fingerprint sensor and EV-DO WWAN card; outstanding service and support. While the bad are mediocre battery life with standard-size cell; fingerprint sensor decreases mouse button size. Laptop Magazine (link dead) picked Dell Latitude D620 as Editor’s Choice with ratings of 4.5 stars out of 5, and concluded that if you need a powerful and always-connected thin-and-light notebook and like the idea of a widescreen display, the Dell Latitude D620 is currently your best choice. The pros are very good performance and battery life, dual pointing devices, durable magnesium design, offers both EV-DO and HSDPA connectivity, spill-resistant, full-sized keyboard, while the bads are no active hard drive protection, low Wi-Fi throughput rate and some blurring when watching DVDs. GCN (link dead) Lab rates the Dell Latitude D620 B+ for performance, A- for battery life, B for features and B for value. GCN Lab concludes that overall, the Latitude D620 is what you’d expect from Dell—a well-built, well-configured enterprise laptop. If you need the integrated smart-card reader, it’s your choice. If not, however, take a look at the HP Compaq nc6320 —a very similar system for a little bit less. IT Week (link dead) concludes with overall rating of 4 out of 5 that if fast graphics performance isn’t a concern, and for most business users it won’t be, the Latitude D620 from Dell would be a good choice, with impressive price. Pros are good range of business features and excellent battery life while cons are a little on the heavy side and poor graphics.